Current ceilometers have a range out to about 25,000 ft, and other models with larger telescopes built in,. can reach up to about 40000 ft. For use in aviation, at airports a range of 12,00 ft is considered adequate. This entry was posted in Atmospheric Physics, Cloud Ceilometer Applications on August 29, 2015 by Mike. The phrase “eye-safe” is used below. Class 1: This class is eye-safe under all operating conditions. Class 1M: This class is safe for viewing directly with the naked eye, but may be hazardous to view with the aid of optical instruments. In general, the use of magnifying glasses increases the hazard from a widely-diverging beam (eg LEDs and bare laser diodes), and binoculars or telescopes increase the hazard from a wide, collimated beam Radiation in classes 1 and 1M can be visible, invisible or both. The beam from a ceilometer has a very low divergence, which is mainly determined by the finite size of the laser source and the ceilometer lens/mirror focal length, but can also be effected by spherical aberration and diffraction effects in the optical path in the instrument. This entry was posted in Cloud Lidar Technology on August 29, 2015 by Mike. Sky Condition, How is it assessed ? A human observer looks at the sky and estimates the coverage in 8ths , 0 being clear sky and 8 being overcast. 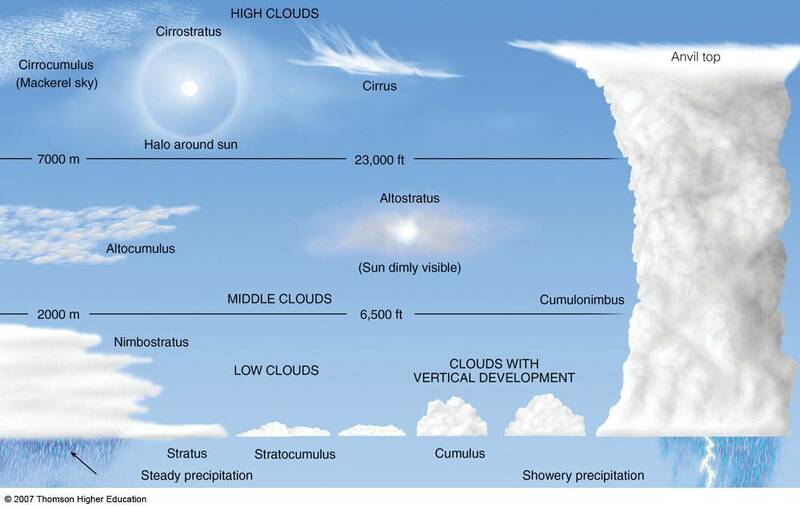 The human observer then estimates cloud height and applies these estimates of cover for each layer. It is quite obvious that if there are no breaks in the sky, any higher layers present cannot be estimated. The human observer also suffers from the “packing” effect of an oblique line of sight , and usually tends to overestimate cover. For each layer the human observer will give the condition FEW, SCATTER, BROKEN AND overcast. A ceilometer can only “see” cloud above it, so can only estimate the sky condition by analysing heights over a time period. The Sky Condition Algorithm in the 8200-CHS is based on that developed by the US National Weather Service and used in their automated surface observing system (ASOS) units and guidelines published by the World Meteorological Organization. A study by the Hughes STX Corp. found that when ceilings were under 5,000 feet, this algorithm agreed with the human observer 78% of the time. With fog, the comparability was 84%, with rain it was 69%, and when snowing 74%. During rain, the NWS Algorithm reported more changes than the human observer. However at the transition between scattered and broken cloud coverage 4 oktas humans often report too much cloud coverage. This is attributed to the “packing effect;” a condition where an observer does not see the openings in the cloud decks near the horizon due to the viewing angle. Pilots tend to overestimate the coverage even more than ground observers because of visual compression. This entry was posted in Atmospheric Physics, Cloud Lidar Technology on August 28, 2015 by Mike. A slight tilting of the ceilometer gives better performance in rain. Consequently, when aligned vertically the backscatter from raindrops may be sufficiently high to cause difficult in resolving the cloud base above the rain. However when tilted, the backscatter of laser pulses by the raindrops is reduced . In heavy rain even a tilted ceilometer cannot resolve the cloud base since the integrated backscatter quickly dominates and prevents further penetration up to the cloudbase, while extinction in the return path also starts to extinguish the return signal.. Please refer to the screen below. These tests were carried out during light rain. 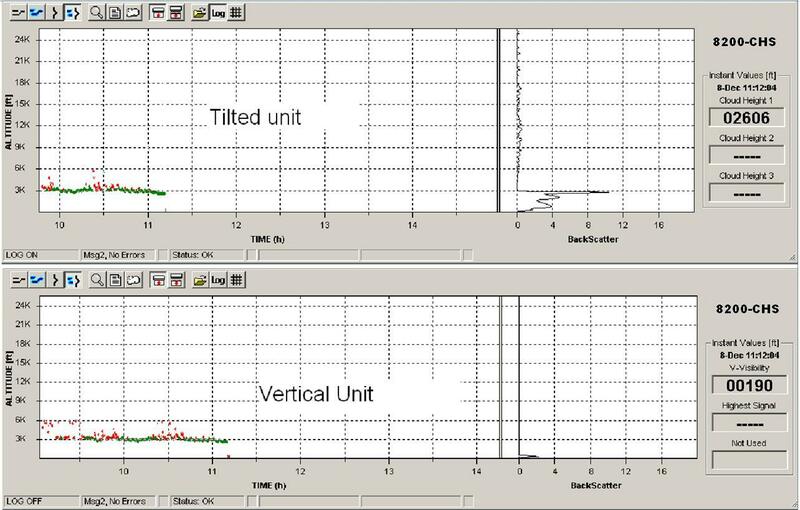 The tilted unit shows resolvable cloud base while the untilted unit reverts to vertical visibility. This entry was posted in Atmospheric Physics, Backscatter Profiles, Cloud Lidar Technology on August 28, 2015 by Mike. The Cloud Appreciation Society has some great cloud Photos and covers a lot of information about clouds from all over the world. Here is one of the really good photos . This entry was posted in Atmospheric Physics on August 28, 2015 by Mike. Stratus clouds, irrespective of altitude have a more or less constant and solid base , indicating stable layers in the atmosphere and lack of thermal activity. This entry was posted in Atmospheric Physics, Backscatter Profiles on August 28, 2015 by Mike. The eye safe limit of the ceilometer . Infra Red Ceilometers must operate as Class 1M lasers which limits the energy density of the beam. The noise level. The inherent noise level of the ceilometer is the ultimate determinant of the signal to noise ratio which enables the ceilometer to discriminate cloud boundary. 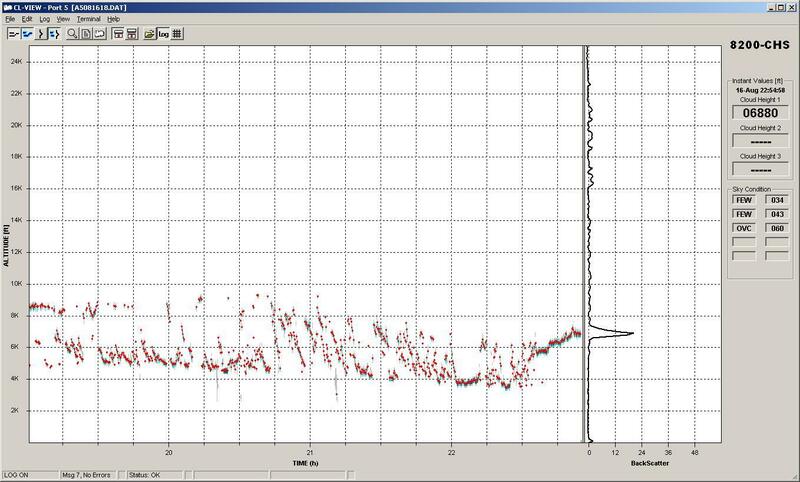 The 8200-CHS has an extremely low level of inherent noise, which is tested for each ceilometer and is recorded as per the backscatter profile below. 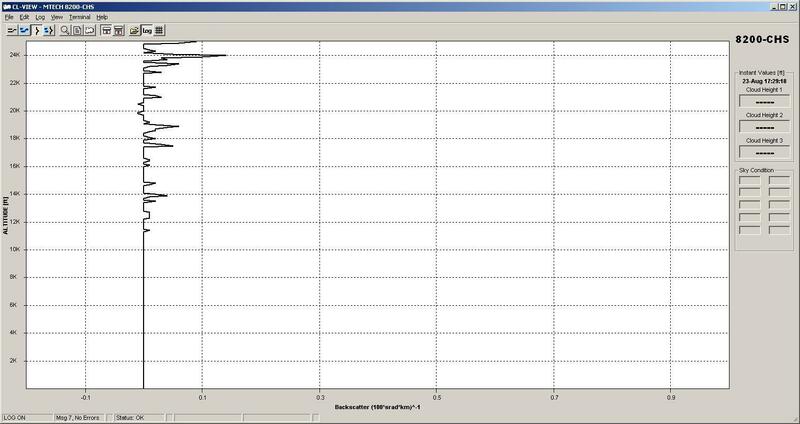 The external source of noise is the shot noise of the scattered and or direct solar radiation within the spectral acceptance of the sensor . The laser operates around 910 nm and the filtering can only limit the “out of band” component of the solar noise spectrum. The ceilometer will thus t\detect cloud at higher altitudes at night. This entry was posted in Backscatter Profiles, Cloud Lidar Technology on August 28, 2015 by Mike.